$1,000 Signing Bonus For Massage Therapists! New massage therapists who apply in April 2018 and are hired shortly thereafter will receive a $1,000 signing bonus. This is based on full time employment but part time massage therapist will receive a prorated amount. Visit our Employment page and apply now to the number one dat spa in Goodyear, Arizona. Hawaiian Experience Spa is the best, and one of the highest paying, places to work for massage therapists in Goodyear, Arizona. We are an ‘ohana (family) and work as a team with massage therapists to maximize your income and work experience. Hawaiian Experience Spa has a fun and diverse work environment where LMTs provide real therapeutic massage, relaxation massage, body scrubs, body wraps, couples’ massages, and much more, in day spas owned and managed by massage therapists to offer you the best working conditions. We have excellent opportunities for advancement with our massage team leader structure. All massage therapists are in teams under a massage team leader who works with you. The team leader reports to the massage therapy manager who reports to the spa manager. This unique structure gives you great support as a Goodyear massage therapist and real opportunities for advancement. Massage therapists only have to come in for appointments, don’t have to wait around between services, have no other fixed duties such as laundry, etc. and can earn an excellent annual wage with industry leading benefits such as medical, retirement plan, paid CE courses, and much more. To qualify, you must be a non-smoker, in good physical condition and dedicated to helping others with your skill. Whether you are an experienced massage therapist, or a newer graduate with passion and potential, we have the career for you. Please click the link below to see list of current career opportunities at Hawaiian Experience Spa Goodyear and other locations. If you choose to take a job as a Goodyear massage therapist at Hawaiian Experience Spa you will be working under one of our team leaders, Jessi or Rina. Both are experienced LMT’s and will help you get the most out of your experience at the spa. The Goodyear day spa in managed by Jodi Ross who is also an experienced LMT. 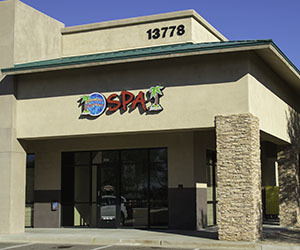 The spa is located in a shopping center with easy parking and stores and restaurants nearly for your convenience. Visit our Goodyear Day Spa page for more information on the spa. $35 – $40 Per Hour with Tips to start! Free use of spa’s amenities such as saunas, steam room, etc. To apply click the link above to see all job openings including Goodyear massage therapists careers. Our Goodyear Day Spa has been open since 2007. It is conveniently located about one minute off I-10 on McDowell Road in Goodyear and serves clients in Avondale, AZ, Phoenix, AZ and other surrounding valley cities. Hawaiian Experience Spa employs licensed massage therapists, licensed estheticians, spa managers, and front desk / receptionists. If you would like us to email you with any new job opening please simply join our email list by clicking here.